Heat a pan at medium heat. Spray lightly with cooking oil. Take a tortilla and cover one half of it with the pizza sauce. Add the mushrooms and green peppers. Sprinkle 1/2 cup of mozzarella cheese. Fold it and cook it for 3 – 5 minutes on each side, until the cheese is melted and the quesadilla is slightly golden. Repeat this with the other quesadilla. Serve immediately and add more pizza sauce if you like. You can use other vegetables to adjust to your family’s tastes. 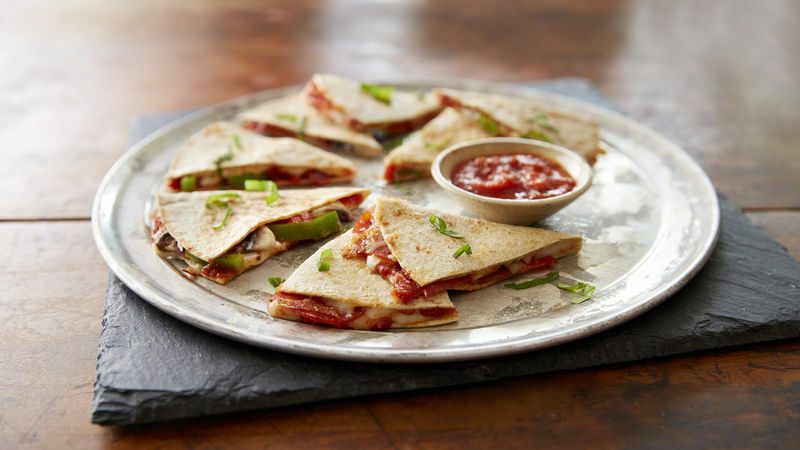 Now that the kids are back in school, my favorite recipes are always the easy and delicious ones, like this pizza quesadilla, AKA Pizzadilla! I make several Pizzadilla versions: some just with cheese, others with cheese and pepperoni, and I make some with vegetables, which are my favorites. I guarantee that your children will love any version you make, and they’ll be completely satisfied. And, the best part is that preparing them doesn’t take more than 20 minutes. Give them a try!